As women, mothers, wives, our hearts are focused on our homes and our families, in this season and every season. We all can use inspiration and encouragement from time to time. 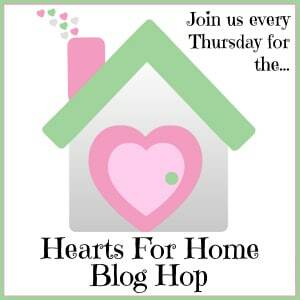 That’s what our Hearts for Home Blog Hop is all about! Every week dozens (hundreds) of posts are shared on topics like homemaking, marriage and homeschooling. You’ll find ideas for crafts, DIY projects and organizing. Every week we have recipes, parenting tips and some sharing of faith and more! Everyone will find something that encourages, inspires, motivates. Last week’s most-viewed post was this article from There’s No Place Like Home discussing the fact that School Might be The Problem in The First Place. and these Caramel Apple Bars from Hello Nature! Share your posts this week, and then take time to discover some new ideas from all the other fabulous posts in this week’s party! Click on the little blue rectangle below to enter your links. Please visit a few other bloggers and show them your support. We all love receiving a word or two from our visitors, so please consider leaving a comment when you find something that inspires you! Grab our button and share it on your side bar or link party page. Please share your family friendly posts with us! By linking up you agree that if your blog post is selected to be featured on any of our hosts’ blogs that we can use an image from your post with a link back to your post. We are here every Thursday – be sure to stop by next week to see who’s been featured. By linking up you agree that if your blog post is selected to be featured on any of our hosts’ blogs that we can use an image from your post with a link back to your post. Thank you for featuring my post and for hosting the linkup! my pleasure, Shelly 🙂 I always enjoy your articles! Congrats on another most-viewed post!